Peak trade: Temporary trend or new normal? One of the ‘stylised facts’ of the last six decades is that international trade has grown faster than global production and income. This contrasts sharply with previous time periods when the elasticity of trade with respect to output was much lower (Irwin 2002). Indeed, postwar history has seen unprecedentedly high growth of global trade relative to global income. This was driven by a mix of technological change, business innovation, and policy reforms around the globe – to say nothing of the re-integration of China into the world economy. The ratio between trade and income or output is not a constant. There have been periods in history when the trade-to-production ratio grew rapidly, and periods in which trade and income have moved much more in tandem. A great expansion in the use of so-called global value chains (GVCs) by large manufacturers and retailers, involving the outsourcing of parts of the production process to firms located in different countries. Starting in the early 2000s, the rate of global trade growth slowed relative to income growth (first panel of Figure 1). Post-2008, trade growth has been particularly anaemic – in line with the very weak GDP growth performance (second panel). Indeed, the most recent data suggest that trade is not even keeping up with global output growth and has started to decline. The OECD reported in late May that total merchandise exports and imports, in current US dollars, for the G7 countries and the major emerging economies (Brazil, Russia, India, Indonesia, China and South Africa – the ‘BRIICS’) fell by 7.1% and 9.5%, respectively, in the 1st quarter of 2015 relative to the previous quarter (third panel). Trade is falling across the board, in contrast to the period immediately following the 2008 financial crisis in the US and Europe, when trade by the BRIICS was relatively dynamic. Exports of the emerging economies fell by 13.5% in March year-on-year (Kynge 2015), with China playing a major role – not only has China’s import demand for commodities been falling, but it is also importing fewer manufactured goods, with knock-on effects for major OECD countries and other Asian economies. Chinese imports (in current US dollars) fell 17% between the 1st quarter of 2014 and the 1st quarter of 2015. For the BRIICS as a group the value of imports fell 18%; for the G7, imports dropped by 11% (OECD 2015). These negative developments follow on a four year period in which trade was essentially flat after having recovered from the massive drop in 2009 (third panel of Figure 1). While the recent numbers are influenced by the appreciation of the US dollar, the basic conclusion remains the same for trade measured in local currencies. Presently, trade is not a driver of growth for either industrialised or emerging economies. Slow trade growth has led to worries that the world economy has run into a ‘peak trade’ constraint, i.e. the ratio of global trade to GDP has reached a limit (Economist 2014). Global trade increased 27-fold between 1950 and 2008, three times more than the growth in global GDP. As a result, according to the World Bank’s World Development Indicators database, the trade-to-GDP ratio for the world as a whole rose from roughly 25% in the 1960s to 60% today. The slow (absence of) growth in trade since 2009 has meant no change in this ratio since 2008. If the recent decline in trade is sustained, this 60% may turn out to be a peak for the world as a whole. This question is addressed in a new CEPR/EUI eBook. The contributors try to untangle the various forces that underlie the trade slowdown. One important element of any such analysis is an assessment of whether the recent situation is mostly the result of macroeconomic forces – basically a cyclical phenomenon reflecting weak demand resulting from the need to rebuild balance sheets and reduce public sector deficits and debt – or if there are other, more structural or longer-term dimensions that are operating in addition to the cyclical drivers and that imply that the world economy may have to adjust to a ‘new normal’ for global trade. Answering this question requires taking account of the macroeconomic (cyclical) factors that suppress trade growth – the post-Global Crisis recession, the weak consumption and investment demand associated with rebuilding balance sheets and reducing debt overhangs, etc. – and then assessing whether this in itself explains much or most of the trade slowdown. If not, the question turns to what other forces may be at play. The literature in this area has focused in particular on the income elasticity of trade as a summary measure of the various drivers of the relationship between changes in income (output) and trade: how trade responds to (is associated with) any given change in aggregate income (e.g. Gruber et al. 2011, Bussiere et al. 2013). As is clear from Figure 1, this elasticity has been declining since the 2000s, suggesting there is more at work than the (clearly important) short-term macroeconomic factors. There is general agreement that a major explanation for the lack of trade dynamism that has characterised the last four years is weakness in aggregate demand, most notably in the Eurozone but also more recently in China. Intra-EU trade accounts for about one-third of global trade and the recessionary environment that has prevailed in the EU since the Crisis struck therefore has had a disproportionally large impact on global trade. In parallel with the slowdown of the Chinese economy, which represents another 10% of global imports, and the recent decline in trade of emerging economies, it is clear that macroeconomic factors have had a major negative impact on trade growth. The more interesting question is whether the current macro environment explains most of the observed stagnation in trade or if there are other factors at play. Some contributions to the eBook – Boz et al., Veenendal et al. and Ollivaud and Schwellnus argue that on balance, cyclical forces are probably the most important factor. But other contributors make a strong case that structural forces are also at work. A number of potential explanations of a ‘structural’ nature (that is, non-macroeconomic) for a decline in the income elasticity of trade are analysed in the eBook. One is that the trade slowdown reflects the end of the integration processes of China and central/eastern Europe – i.e. the high trade growth was largely a transitional phenomenon. A second is that that it reflects the limits having been reached on the ability of (incentives for) firms to engage in the international fragmentation of production that is part and parcel of GVCs. A third potential explanation is a rise in government support for domestic industries, reducing the incentives for firms and households to buy goods and services from foreign suppliers. All the contributors to the eBook agree that developments in China are important both in understanding the large increase in the global income elasticity of trade that occurred in the 1990s and the subsequent decline that started in the mid-2000s. This can be seen as a transitional factor, in that the (re-)integration of both Europe and China with the world are time-bound events that imply high trade growth rates that cannot be sustained – once the adjustments have occurred associated with what is to a large extent a move from autarky, trade will inevitably grow much more in line with income. Of particular importance as far as China is concerned is the decision by the government to rebalance the economy towards domestic absorption and away from an export-driven growth model. As argued by Gaulier et al. in their chapter, China’s re-integration had a juggernaut effect on the volume and structure of world trade. It is not clear whether other regions of the world – including other emerging economies such as India, Brazil or Nigeria/South Africa and their respective neighbourhoods – could in turn become new trade juggernauts that will drive the global trade-to-GDP ratio to a higher level as a result of actions to lower trade costs and pursue regional integration of markets. The world has changed with the rise of China; the country will be a serious competitor for such new entrants, who will find it more difficult to emulate the export-driven growth strategy that was pursued by China and other East Asian economies in recent decades. Views differ on whether and to what extent the trade slowdown is due to ‘diminishing returns’ to GVC-based international production strategies. There is general agreement that GVCs were a factor behind the rapid growth of global trade relative to income in the 1990s and the first half of the 2000s and that this helped to explain the collapse in global trade in the immediate aftermath of the 2008 Crisis, as well as the rapid recovery in 2009-2010 (Baldwin 2009). One reason why the adoption of GVCs led to an increase in the trade/GDP ratio is because this is an artefact of the way that trade and GDP are measured. Trade flows are recorded on a gross value basis, including the value of the intermediate inputs that are embodied in a product. Thus, an input that is shipped from country A to B as part of a GVC is measured as an export from A to B; the value of the subsequent export of the processed product from B to C (or back to A) will embody the value of the imported input. From a value added perspective, this implies there is double-counting. GDP, in contrast, is a value added concept: it is the sum of all value added that is produced in an economy, including only net exports (exports minus imports). The more international production is fragmented across countries, the greater the associated gross trade flows relative to total value added. Insofar as at some point in time businesses achieve what they perceive as the optimally dispersed use of GVCs, the growth of trade associated with this process will slow and increase more in line with total output (value added) produced. Indeed, if business managers decide that it makes more sense (i.e. it is more profitable) to shorten supply chains or to ‘re-shore’ production, the result will be that recorded gross trade flows fall and that the difference between the gross value of trade and trade in value added will become less. Supply chain specialists predict that in the coming years there will be a move away from highly fragmented, globe-spanning supply chains towards a greater reliance on regional production networks (Srinivasan et al. 2014, Stank et al. 2014). This may also be the result of the adoption of new technologies such as 3D printing (‘additive manufacturing’). There is also no agreement regarding another potential explanation for the trade slowdown: protectionism. The majority view is that protectionism has not played a major role in reducing trade, although many contributors recognise this may be a factor at the margin. In their contributions, Simon Evenett and Johannes Fritz disagree with this position. They argue that even if policy has limited effects for the world as a whole (which they do not believe), it may have significant impacts on specific (groups of) countries and on specific sectors. More generally, they make the important point that many of the policies that appear to be pursued by governments are directed towards assisting domestic industries through subsidies or the tax system, as opposed to large-scale increases in the average level of border protection. The impacts of different types of ‘murky’ policies on specific countries and sectors may be more significant that is generally presumed to be the case. There are a number of reasons why trade may well grow faster than income in the coming decades and as a result drive the ratio of global trade (exports plus imports) to GDP beyond the level at which it currently seems to be stuck – around 60%. One possibility is that ongoing and future technological change, the adoption of new international business models, and additional trade policy reforms will support more rapid growth in trade. As stressed by Ahmed, Bieron and Melin, and by Shehata in their chapters, there is great potential for trade to grow faster than income looking forward because technology is enhancing the ability of small firms to engage in international trade. The internet, digitisation, more efficient logistics, e-payment systems, translation software, and so on are all potential drivers of the internationalisation of SMEs. Another potential driver is that in the future trade in services may expand significantly faster than trade in goods, especially if account is taken of the fact that services trade involves sales through FDI. Recent efforts by the OECD and the World Bank to collect information on the restrictiveness of trade policies for services show clearly that barriers to trade in services are often significant.1 New vintage trade agreements such as the Canada-EU Comprehensive Economic and Trade Agreement or the Transatlantic Trade and Investment Partnership may result in a reduction in the average level of services trade costs. Unilateral actions by governments to enhance competition on services markets as an element of increasing productivity performance may also help foster greater trade in services. Services are more tradable than is generally thought (Gervais and Jensen, 2013), so the impact of services trade restrictions is a real barrier to potential trade expansion. Of course, it may be that progress in liberalising trade in services will not be achieved. Indeed, insofar as the trade slowdown is in part due to beggar thy neighbour policies and these are extended to services and related policy areas (such as data flows), the world may experience slow trade for some time to come. The fact that most policy attention has centred on the use of traditional trade policies – tariffs and so-called temporary trade barriers such as antidumping (generally not that temporary) and safeguard measures – as opposed to other policies that may distort trade much more (subsidies and other measures to support domestic firms) is worrisome. The contributions to this CEPR/EUI eBook make clear that a combination of cyclical and structural factors is negatively impacting the growth performance of global trade. The impact of the macroeconomic situation post-2008 Crisis – notably the weakness in aggregate demand and within that, demand for durables and investment goods – played a major role in the recent trade slowdown and continues to do so. The gradual rebalancing of the Chinese economy away from an export-driven model towards greater reliance on domestic absorption is an additional factor that comes on top of the weakness of the Eurozone and is having additional knock-on effects on other emerging economies. There is clear evidence that trade growth began to slow down before the 2008 Crisis hit, and that the very high growth of global trade relative to GDP was in part a consequence of the re-integration of China and central and eastern European countries into the world economy, which in turn was facilitated by the rapid growth in GVC participation and associated FDI flows. This process, by its nature, was a transitional one, generating trade growth rates that inevitably had to taper off once the adjustment process associated with re-integration had run its course. It is important to differentiate between the ‘China factor’ and ‘diminishing returns to GVC strategies’ explanations for slower trade, as GVC growth has been a major feature of China’s trade expansion (as it was for central and eastern Europe). The potential for greater use of the ‘GVC technology’ and further specialisation and fragmentation of production remains very significant for many developing countries, arguing against the conclusion that the world has attained ‘peak trade’. On balance, once the cyclical headwinds have abated, it is likely that trade growth will exceed GDP growth once again, albeit not as much as during the 1990s given the transitional nature of the trade growth attained by former centrally planned economies. Much will depend here on the extent to which regions of the world that have lagged behind Europe, East Asia and North America manage to increase their participation in GVCs and the international fragmentation of production. This depends importantly on policies – action by governments to reduce trade costs and to refrain from ‘protectionism’ – and on the extent to which international trade in services and digital transactions will expand in coming years. If the ‘so far so good’ assessment of trends in trade-distorting policies post-Crisis that has been the prevailing view needs to be revisited, this will imply additional headwinds for trade growth looking forward. At the end of the day, an increasing trade/GDP ratio is simply a reflection of greater specialisation. The fragmentation of production that is reflected in the expansion of GVCs also occurs domestically. If on net the global trade/GDP ratio levels off, there may well be substantial scope for continued fragmentation and specialisation within countries and regions. As argued by Moreira et al. (2013), among others, domestic trade costs matter as much as international trade costs; for some countries they may be substantially higher (e.g. Indonesia, a very large archipelago). These considerations illustrate the importance of continued – indeed stronger – focus on efforts to reduce trade costs broadly defined, both domestic and international. Baldwin, R (ed) (2009), The Great Trade Collapse: Causes, Consequences and Prospects, London: CEPR. Bussière, M, G Callegari, F Ghironi, G Sestieri and M Yamano (2013), “Estimating trade elasticities: Demand elasticities and the trade collapse of 2008-09”, American Economic Journal: Macroeconomics 5(3), pp. 118–151. The Economist (2014), “International trade—A troubling trajectory”, 13 December. Gervais, D. and J.B. Jensen, 2013, “The Tradability of Services: Geographic Concentration and Trade Costs,” NBER Working Paper 19759, Cambridge, MA. Gruber, J, F di Mauro, B Schnatz and N Zorell (2011), “Where are global and U.S. trade heading in the aftermath of the trade collapse: Issues and alternative scenarios”, Board of Governors of the Federal Reserve System International Finance Discussion Paper No. 1017, Washington, DC. Irwin, D (2002), “Long-run trends in world trade and income”, World Trade Review 1(1), pp. 89-100. Kynge, J (2015), “Emerging markets trade slide is made in China”, Financial Times, 2 June. Moreira, M, J Blyde, C Volpe Martincus and D Molina (2013), Too Far to Export: Domestic Transport Costs and Regional Export Disparities in Latin America and the Caribbean, Washington, DC: IDB. 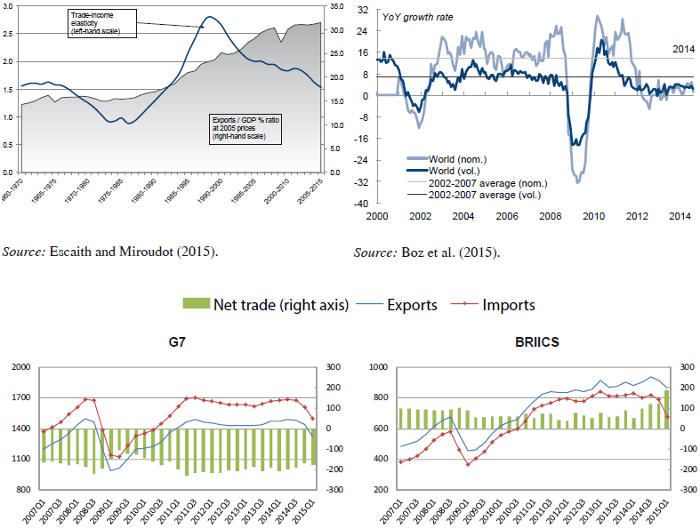 OECD (2015), “International trade slows sharply in first quarter of 2015”, Press Release, 28 May. Srinivasan, M, T Stank, P Dornier and K Petersen (2014), Global Supply Chains: Evaluating Regions on an EPIC Framework – Economy, Politics, Infrastructure, and Competence, New York: McGraw-Hill. Stank, T, M Burnette and P Dittman (2014), “Global Supply Chains”. 1 See http://iresearch.worldbank.org/servicetrade/aboutData.htm and http://www.oecd.org/tad/services-trade/services-trade-restrictiveness-index.htm. Author: Bernard Hoekman is a Director, Global Economics at the Robert Schuman Centre for Advanced Studies, European University Institute; CEPR.